Ali and Mona continued to dig for the truth regarding Taylor Hotchkiss on "Pretty Little Liars: The Perfectionists." HOLLYWOOD—Now that Dylan, Caitlin and Ava have their sights set on someone who they ‘think’ may have a person of interest who is trying to set them up on “The Perfectionists.” This week’s episode, ‘The Ghost Sonata,’ saw Alison kick things into full gear in her pursuit to locate Taylor Hotchkiss. Alison doesn’t think she is dead, and the audience knows with certainty that she is not. It’s all about finding out where she is hiding and why. Mona learned a bit more about Caitlin, just as she dug a bit about her relationship with Ali. It is so interesting to see these characters, act like they don’t know each other. Jeremy and Caitlin: really trying to pull one over Claire acting as if you don’t know one another, yeah good job on that. This woman is devious; she’s asking Caitlin to spy on Dylan and Ava, which she refused to do. So how would Claire respond by having Dana turn up the ‘heat’ on the trio, but I wonder precisely what she has in mind. Caitlin decided to get close to Mason to see precisely what he is up to, which Dylan and Ava were against. The trio saw an anonymous threat via a message that read: “I SEE A RAT.” Alison heeded a bit of advice to the coeds to let them know that secrets can help them bond. Claire and Ali continued to bond over their past, as Ali dug into Claire’s past and learned a bit about the security system and Mr. Hotchkiss. Dylan found himself under fire when his boyfriend discovered that he could sustain a serious injury if he doesn’t pump the brakes on his intense violin playing. Caitlin was ready to implement her plan, but was concerned she was being watched by an anonymous source. We keep seeing this issue regarding a link between Alison and Taylor. Like as a viewer, we know something exists, the problem is that is secret is not coming to surface anytime soon. Caitlin was stunned by Intel that Mason disclosed, which Ava immediately picked up on. She disclosed the information to Dylan, but he was completely off in another world. Caitlin was not happy that Jeremy was keeping a watchful eye on her. 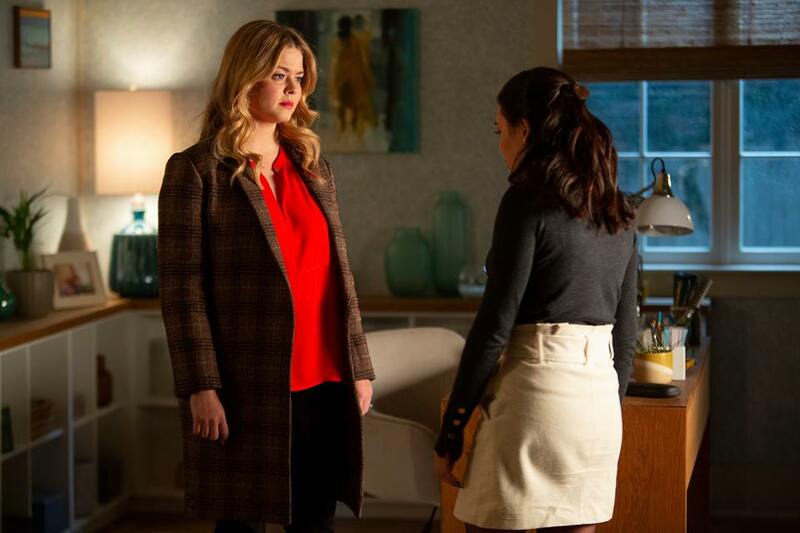 Caitlin felt comfortable sharing more information with Alison about her twisted past with Mason and how she fears that Jeremy could be collateral damage. This name Ray Hagadorn keeps popping up and he’s connected in some way to Taylor and Alison, which has Mona spiraling in circles to try to figure it out. Ali wanted to make amends with Emily, but found it tough to sign those divorce papers. Wow, Emison is no more America, if this was “Pretty Little Liars” this would be a game-changer, but it’s not. Ali was intrigued by that map that Taylor crafted and her inquiry to finding the Emerald City kicked off a big twist that would transpire during the final moments of the episode. That seems to be a major clue to honing into Taylor’s whereabouts. Caitlin revealed to Ava that she was the rat, which her pal did not seem surprised to hear, but it caused a major fracture in their relationship, not in a good way. Mona ventured into a place that was riddled with clues pertaining to Nolan’s murder and it was reminiscent of “A” all over again. She came face-to-face with Ray, but we have no clue why all that stuff about Nolan and Taylor was plastered in that house. The final moments were a thrill, as Ali found herself inside a camper, where she came face-to-face with Taylor who fled upon being spotted. I didn’t expect that reveal so soon, but it does indeed change everything. So Taylor has been busted and Ali looks like her prisoner now? Oh, let the games begin. Until next Wednesday “Perfectionists” fanatics! Previous articleFairytales Do Come True!